Darkness fell all over the land. Soaked and tired, the old blacksmith continued his work. He knew that he couldn’t stop working. Not yet. Not until he has finished. Some say it is only a story, a myth. But his detailed craftwork remains till today. 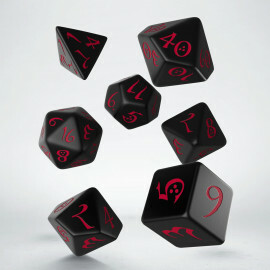 Q WORKSHOP presents the unique Metal Mythical Dice Set. Help the gods fight against the evil mythical creatures! There was the time of myths. the real golden age of all epic stories. All games should make us remember these beautiful day dreams, and tales about brave heroes, monsters, magical artifacts and journeys beyond the known horizon. One from the symbols of mythic age was Daedalus, father of a suicide romantic, the inventor of robots, the goddesses garden’s designer and the builder of Labyrinth, the most expensive and sophisticated cowshed for a son of a bull. 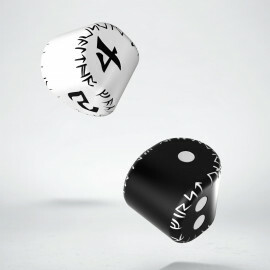 Q WORKSHOP presents the unique Metal Mythical Dice Set. 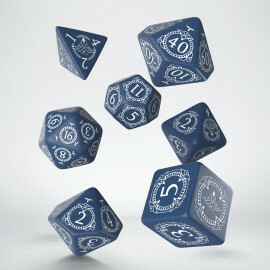 The patron of this set full of polyhedral metal dice, made of tin, is mythic Daedalus himself. We decorated the mastercrafted dice with engraved stylized Greek numbers and covered with small Labyrinths, symbols of Daedalus masterwork. Each die is adorned with sculpted geometric borders on the edges and pentagons in the corners. We supported the heights of crafts in this set because the first time we feel so great need to honor the great inventor with the best design. Dedalus was really genius, so our dice shouldn’t be the disappointment. Better than Legen – wait for it – dary! All in this set is best of what we can do in dice sets making: best metal, mastercrafted design with a hint of genius, elegant box. We hope that Daedalus would be proud of us. This set is Mythic, not only Legendary. Legends are about normal heroes, myths are about demigods. We wish your roleplaying characters to become mythic heroes and heroines of greatest stories. Maybe these stories will be told only for a few of your friends, but this never makes these tales smaller. It's not important because these will be your adventures, your struggle with fate and your victories. Be a mythic hero. Help the mankind fight against the evil mythical creatures. 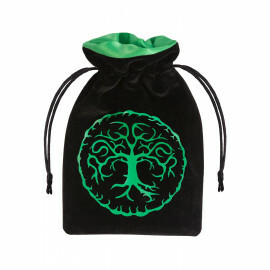 Every throw of these beautiful dice will summon the unstoppable powers! Every throw can make your characters the greatest hero of myths. It's not important where or in which universe, the Myths are immortal, as our metal dice.